The Pampas grass in the middle of the Island Border was here when I arrived. I was always caught trying to weed underneath it without gloves on, ending up with cut fingers. One spring it seemed to suddenly divide in two and died in the middle. It was hard work cleaning the mess, but well worth the effort - the following season it flowered more than ever. I'm sorry to say that back then I thought it was the New Zealand variety. Oops. New Zealand Pampas has soft plumes which can be tinged pink - it's called Toe Toe, smaller and more refined than the Argentinean (a coarse, agressive plant which is gaining pest status in many areas). 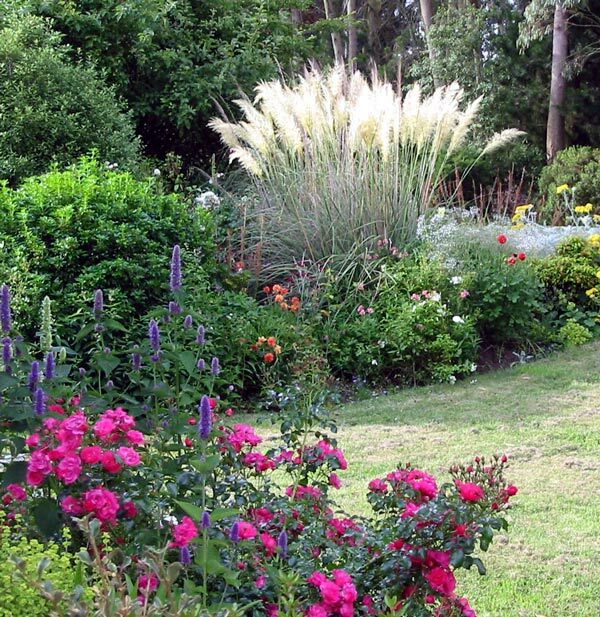 Argentinean pampas was popular in urban easy-care gardens back in the 1980s. It was also planted on farmland, often alternated with species Phormium Tenax (New Zealand flax) along fence-lines. After some years of confusion, the Island Bed's Pampas Grass (the subject of these photographs) was identified as Cortaderia selloana, a non-native. In my defence, I'd been confused by its somewhat discrete growth habit. Alas, it was definitely an imposter. And after being damaged in a winter snowfall I decided to dig it all out (wearing thick gauntlets). Now the only Argentinean Pampas left in my garden grows on a messy fence-line, out of sight. This is not a plant I'd ever recommend to feature in an ornamental border. It tend to behave like a bull in a china shop - gardeners, beware!